Live notifications alert you when your pals turn on their video in a public (unlocked) room on Paltalk. You are automatically defaulted to follow your Pals - you do not need to 'follow' them manually. 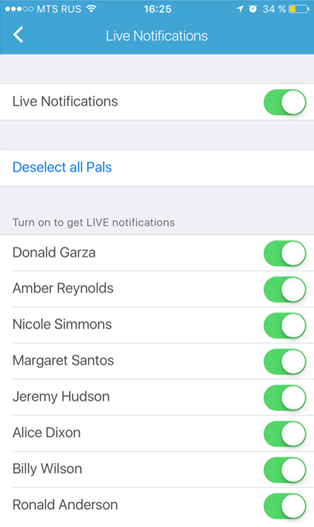 If you do not want to receive notifications you may turn off, or choose which of your Pals you would like to receive notifications for in the app settings. To turn off all LIVE notifications use the 'live notifications' switch on the top of the screen. Note: When you publish your video camera in a chat room you will send a notification to everyone who has you on their Pal List about what room you are in. There is no 'switch' to turn this on or off yet. It will be added to your account settings when you log in at the top right of www.paltalk.com. Please leave a message with the exact spelling of your Paltalk nickname and we can manually turn this feature off for you as we wait for everything to be updated on our web site.